The HQ Shadow is probably the best value for money, fully trickable, (super) Ultralight on the market and would certainly fly in the sort of winds you're talking about. However, like Tom I'm not sure I'd recommend it for a new flyer as, like most ultralights, it's lightly built. From what I have seen the 4D might be a more durable ( if not as trickable) option for you until you have a bit more experience. Thanks for all the reply's so far. Let me answer the few questions I have seen asked so far. 1. Price: I would prefer not to spend 300.00 but am willing to if its worth it. 3. I am at sea level. Do you know if the wm ul and the hHQ shadow can be purchased from steve here or do I have to look else where? You've got the same wind I do, pretty much. Over the years, I've accumulated around a dozen light wind kites, some good, some not so good. The Zephyr that you considered is a very versatile kite, can fly real low with the right lines and adjustments, and it will fly comfortably up to 15mph. I carried it in my car all the time for 2 years because of the compact case, wide wind range, and it's just plain fun to fly. The 4D will probably fly lower, but it's a small kite. I have never flown a small kite that I liked, but I've never flown the 4D, so I really can't say... it does seem to have nice specs, other than its size. I have a Shadow, it's a really nice kite for the money, good bang for the buck. The Exile UL was mentioned, that's a nice step up from the Shadow, and will fly really low. If you just want to fly and not do too many tricks, kites like the NikNak or Ozone are great. They'll fly when smoke can barely tell what direction to go. I don't see that Steve lists the Shadow on the store's site, but I'm sure that he sold them. You should ask him if that's what you want. I think you have to order the WM direct, just like the Exile UL. If you want to try before you buy, meet me out in the field someday. I was wondering when you were going to chime in being you know about our ever changing winds here on the east end. I hope I will be able to head that way on sunday if you are out flying. I will know a little more by friday. I'll call you on that I can easily feel less than 2mph. Far be it for me to cast aspersions on someone's windspeed divining skills but 2mph has generally been considered the least that can be felt by most people. The standard experiment is to stand on a treadmill set to 2mph. What do you feel then ? This "I can feel ½mph" is one of the reasons why some UL and SUL kite's low end wind range is so far from reality. You don't need the most accurate type of wind meter to determine if the wind is less than 2mph. If you have a meter that has an accuracy of even + - 50% at 1mph that's .5 to 1.5mph and I doubt they are anywhere near that inaccurate. I don't think most treadmills set to 2mph are any more accurate than a wind meter at that speed, probably less so. I've used meters that show less than 2 and I can feel it. Determining the direction can be a challenge in super low wind but is easily doable too. Back to ULs. $ 300 bucks gives you LOTS of choices. 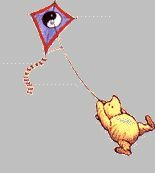 The Shadow is a bit squirrely but is a very light wind trickable kite. I feel the HQ Breeze will go lower but is less pitchable but smoother. Cascades, Flic Flacs are there but tough to hit. The Shadow will hit these and hit some Yo-Yo based stuff too. The Widowmaker UL is kind of like Blue Moons ULs in that they are more of a UL / SUL. I haven't flown it side by side with the Shadow but my sense is that they have a similar low wind capability. In my opinion, the WM UL is way smoother and better behaved. They are very well made too. Jon makes the Freestylist UL too and it's less than 200 bucks. You don't need the most accurate type of wind meter to determine if the wind is less than 2mph. But you really do if you want to measure it properly. That's why they make them. That's why they developed an entirely different methodology to the rotary anemometers that most people, including me, use. And if you're then going to go on and claim that you can feel a wind and that your reasoning that it is below 2mph is a handheld "wind meter" or, goddess forbid, something off your iPhone then you're working with faulty data. Kite advice:- Buy a Cosmic TC Ghost and move about a bit. you're working with faulty data. Not faulty data but with a % margin of error. I would never claim I could tell if the wind is 1.3759824 mph or any other exact speed for instance but I just may be able to "feel" it. It doesn't really matter. Either the kite will work for you in the current conditions or it won't. Some will work with less wind than others. Others can't handle changes in direction / velocity as easily, this is even more important to where I fly because of the variable nature of the wind. The best my favorite UL trick kite I've ever flown is the Mohawk XS UL. Now that the Euro is down, it should come in right at your $300 and is available from a forum sponsor too. If you're willing to wait for the British Pound to follow the Euro, go for the Talon UL! Been thinking about that one. What do you consider the realistic low wind on that one? I'll shy away from stating actual numbers, and do it comparative style.